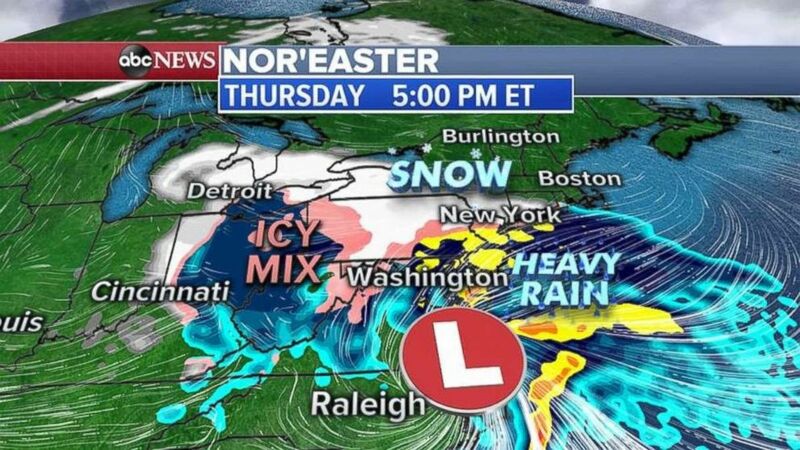 A Nor’easter is churning up the East Coast Thursday, bringing many Northeast cities their first snowfall of the season. The snow has already hit the Washington, D.C., area, coating roadways with ice and sleet. Over 1.5 inches have already been reported in the area so far. 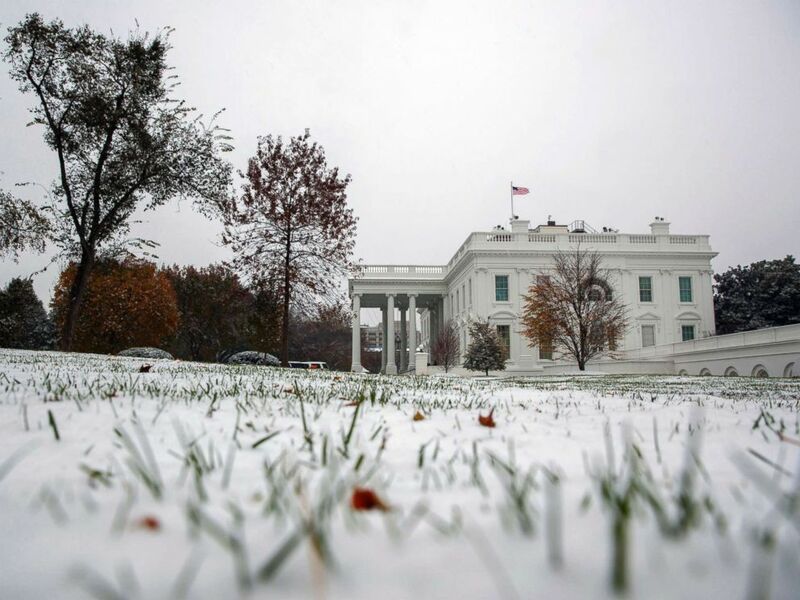 Snow covers the grass outside the White House, Nov. 15, 2018, in Washington. As the storm moves along the coast Thursday, a heavy burst of snow will hit along the Interstate-95 corridor, including New Jersey, New York City and Boston. 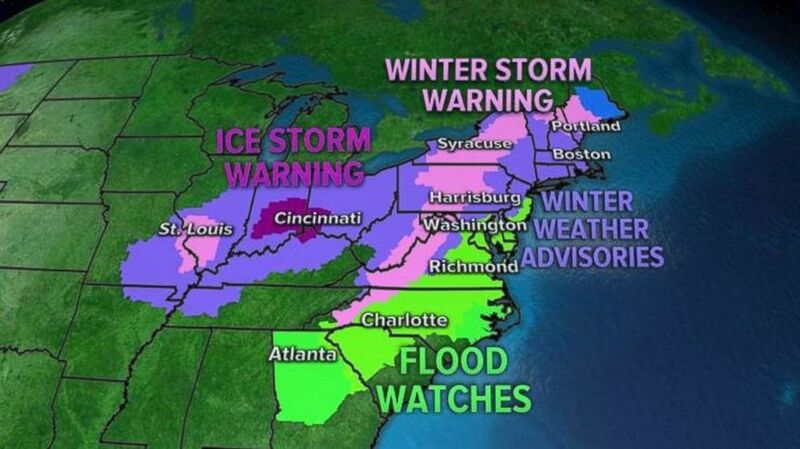 Alerts are in place on Thursday as a nor’easter moves into the Midwest and Northeast. By the evening rush hour commute, the snow will change to freezing rain south of New York City. But inland areas in Pennsylvania and upstate New York will continue to see snow. Snow will move into the Northeast on Thursday afternoon. Overnight the snow will become rain, but inland areas of Virginia, Pennsylvania and New England, will continue to get snow, sleet and freezing rain. The highest snowfall totals will be in central Pennsylvania, western New York and northern New England, where residents could see up to eight inches of snow. Three to six inches of snow is expected just west of the I-95 corridor. New York City and Boston will only see about one inch. The last time New York City saw more than one inch of snow in November was in 2012. 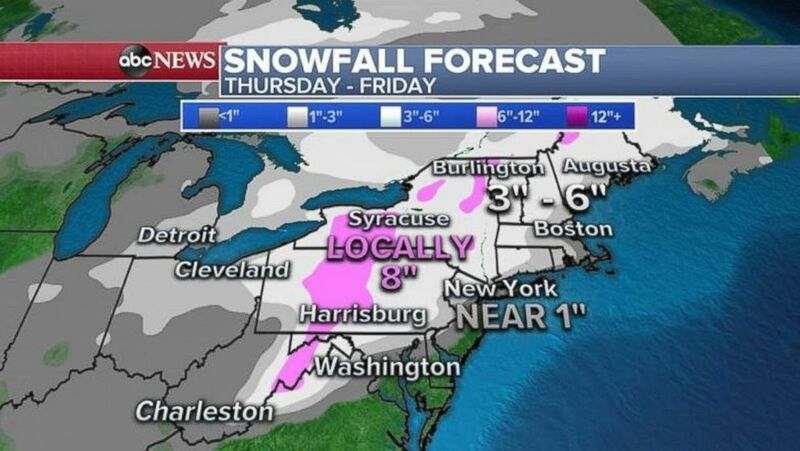 The heaviest snow will fall in central Pennsylvania, western New York and northern New England.